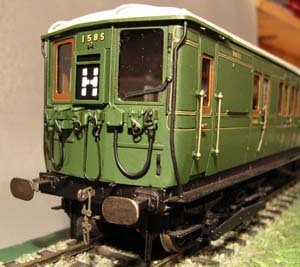 Etched brass kit with pre-formed brass roof, seats, bogies and cast whitemetal fittings. Add to 7EMU2 to make a post-war 4 SUB unit. Four axles coach disc wheels needed to complete. Motor bogies, EMU jumpers, conductor rail chairs and other accessories suitable for EMUs are listed in '7mm Scale Coach Bogies and Accessories'. They are listed this way to avoid anomolies in the way the site computes postage.